Joseph Bharat Cornell began running in junior high. He never joined the track team. For Joseph, running grew out of his love for nature. 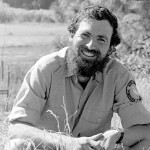 At Chico State, Joseph designed a major in Nature Awareness. And after working for several years as a nature educator, he wrote Sharing Nature With Children, which was first published in 1977 and has since sold half a million copies worldwide in 15 languages. In Japan alone, 12,000 Sharing Nature teachers now teach Joseph’s methods to other teachers. The Japanese government has endorsed the Sharing Nature activities for use in public schools. Joseph came along at a time when nature educators were desperate for a change. Most nature books and teaching methods were based on cramming kids’ minds with dry facts. But Joseph’s new ideas reflected how he had always preferred to study nature – up close and personal. I suspect that Joseph’s ideas seeped into my pores, and leaked out decades later in my book. And I thank Joseph for helping me find the way. Joseph’s workshops always begin with lively games that get kids’ energy flowing. Once they’re feeling awake and enthusiastic, he leads them in quieter games that focus their attention. For example, he might have them sit with their eyes closed and count the number of sounds they can hear in nature: bees buzzing, birds chirping, the wind in the trees. As the Flow Learning experience progresses, the games get gradually more refined, until the kids are deeply absorbed in whatever is happening in nature all around. The stages of “Flow Running” are similar. But whereas Flow Learning begins with high-energy games, a body that’s starting out on a 2-hour run may need more warmup time. Once energy begins to flow, it automatically stimulates the heart – we begin to feel more upbeat, positive, and enthusiastic. In turn, positive feelings fuel our will. Flow Learning is based on a simple insight – “expansion equals joy.” Joy comes when we wisely use the five instruments through which we interact with the world: body, heart, will, mind, and soul. We find joy when we run in ways that expand our health, love, strength, wisdom, and awareness of Spirit. In the 1970s and 1980s, I attended several of Joseph’s workshops and took pictures for his brochures. I found it remarkable how the kids, who were initially impatient and distracted, would quickly become drawn into the hijinks and fun of the Awaken Energy games, and how the Focus Attention activities would bring their energy into intense concentration on interesting aspects of nature. And finally, how the “Experience Directly” activities would take them into deep inner communion with nature. In the last stage, “Share Inspiration,” I could feel that their hearts had been truly opened, as they shared moving stories about their experiences. Mind you, these weren’t trained Buddhist monks, but typical American kids of the pre-Nintendo generation. If these ideas seem perilously close to spiritual practice, that’s because they are. In many parts of the world, spirituality is held to be an accepted, eminently practical feature of daily life. Joseph has shown how universal spiritual principles can deepen an important aspect of our lives: our relationship with nature. You don’t often hear people talk much nowadays about “spiritual runs,” as we did in the early 1970s. Today you’re more like to hear them discuss their stock portfolios. Still, I suspect that many people do yearn to discover a larger meaning when they run. Joseph’s methods can take us there, in a practical way that works with energy. I hope that Fitness Intuition will be a worthy stepchild. 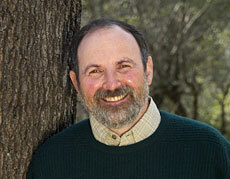 To learn more about Joseph Bharat Cornell, Sharing Nature, and Flow Learning, visit the Sharing Nature website. The Nature Awareness Activities page will give you a taste of the Flow Learning nature games. And for a lovely online nature hike, see the Trail of Beauty slideshow on the Sharing Nature site.